Judy's Doll Shop | Musical Christmas Teddy Bear - "Cinnamon"
Musical Christmas Teddy Bear - "Cinnamon"
The Christmas Teddy bear wants nothing more than to give his heart away forever. "Last Christmas I gave you my heart ..." The Christmas Teddy bear wants nothing more than to give his heart away forever. And this can happen exactly 2,014 times: the gift-wrapping falls away to reveal a 13 inch bear in a gently curled cinnamon-colored plush out of finest mohair. The silver-colored bell on his hat rings gently when you pick him up. 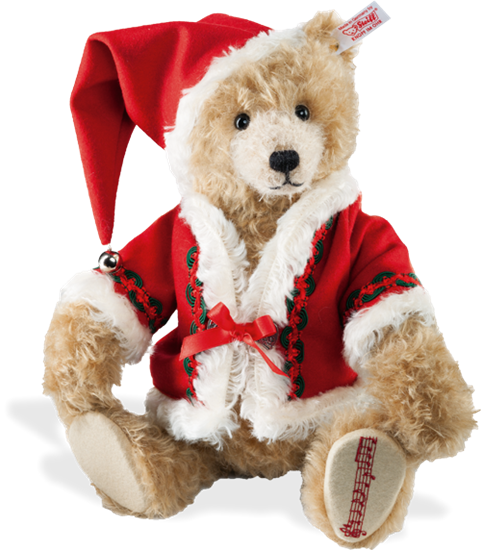 The cuddly bear also sports a magnificent coat of red loden flannel - with trimming, satin ribbon and white mohair around the edges. He can sit or stand up and his left sole is adorned with the notes of "Last Christmas", which plays when you press the music box. And the bear and his owner are at one in heart and soul ...Cinnamon is 5 way jointed with black safety eyes and has the white tag "Button in Ear".